When describing heavy metal bands and records, writers too often fall into the same ways of conveying what they’re hearing. This moron writer is included in that. I don’t know how many times I’ve described something as nightmarish, but each time I do, I try to make sure that term actually applies. Today, that descriptor never has held as much weight as it does now. “Matricide in the Temple of Omega” is the new offering from black metal/death metal beast Ævangelist, who have given us plenty of torment and fear over the years. 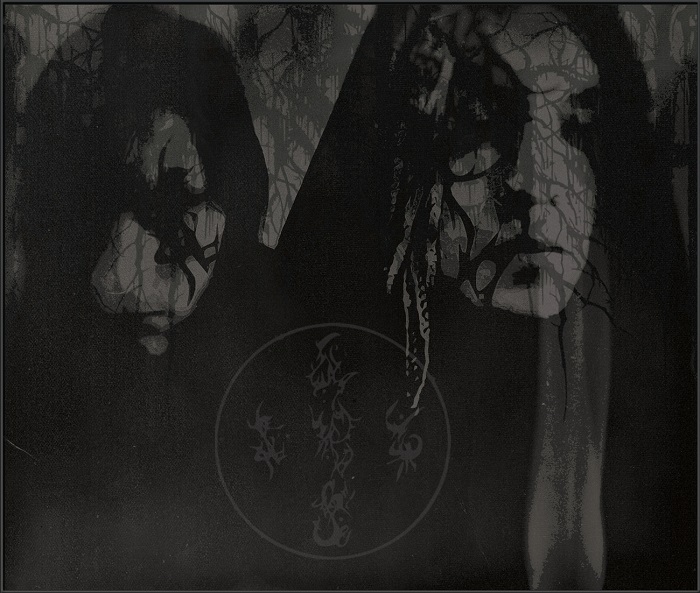 The duo of Matron Thorn (guitars, bass, drums, noise) and Ascaris (vocals, lyrics, cello, sax) tear into the most vulnerable areas of your psyche and deliver a formless void of horrors that never allows you to feel even remotely comfortable. Over these six tracks and nearly 62 minutes, the band takes you into a, yes, nightmarish world that feels foreign to your own and brings with it violence, off-setting melodies, stabs in the dark, and bloodshed that’s created in torturous ways that are inventive even to the most depraved and sickened minds. If you’re new to this band, it’s probably going to take some time to sort through all these layers and make sense of this, not that it’s something even the most tenured of listeners can even do with any regularity. That’s all part of the fun, by the way. “Divination” is a quick minute-long intro cut that’s immersed in a noise haze and bizarre transmissions before we head into 10-minute “Æon Death Knell” that tears open and immediately has you going for the panic button. Ascaris’s growls are frightening on so many levels, as she works to disarm you and deliver her hideous message. Warbled singing is marred by noise, while the guitars mar and punish, and noise hangs ominously like a cloud. The song then goes for the throat, wailing and burning, as terrifying growls twist your mind, and tornadic riffs roll on and repeat, adding to the psychosis. The fever keeps increasing in degrees, while the track scorches, slows into a sludge, and bleeds out in agony. “Omen of the Barren Womb” runs 13:18 and lets confusion reign right from the start. Guitars charge and chug, as chaos storms and saturates the ground, with Ascaris’ growls adding to the pain and sending you into a vortex of misery. Noise spreads its campaign of sorrow, causing your head to swim through blade-filled waters before the track mercilessly fades into sounds. “The Sonance of Eternal Discord” runs 11:12, and it greets you with unexpected warmth and a long introductory transition before the pace begins to swelter and spread, picking up heat as it moves along. Ascaris’ growls peel away at the flesh, with pained singing sliding behind the scenes before the pace settles, the track soaks in a sound bath, and everything slowly expires. “Serpentine as Lustful Nightmare is the second-shortest track at 7:52, and it makes the room spin violently from the start, with the playing blistering and shredding bone, while the riffs unload and add even more dizziness for your already wobbling brain. Wild cries jar the senses, while the riffs pummel, and everything ends abruptly. Closer “Ascending Into the Pantheon” is the longest track, running 18:32 and beginning with guitars awakening and an eerie sense floating off into space. The growls are buried in filth, while hypnosis returns with even greater impact, while riffs trudge, and the pace speeds ahead. Things then get warped cosmically, with rubbery melodies and alien-like static, as a strange voice emerges, delivering a chilling message. It feels like a statement is being conveyed from dimensions beyond, as the music darkens and provides a ghastly vehicle for this message to take the track to its final resting place. With every new Ævangelist that comes around, it’s another opportunity to expose yourself to some of the most deranged metal there is in any form. “Matricide in the Temple of Omega” delivers terror and madness like no other bands, and this display is one that’ll jar you to your core. This is the stuff of mental damage, the thing that creeps into your head at night and makes you awake screaming, covered in sweat.